The Challenge Cup final at Wembley Stadium is to be moved from August to July in 2020. The Rugby Football League have signed a new deal for the final to remain at Wembley, its traditional home for almost a century, until 2027. Chief executive Ralph Rimmer said: "This is a significant and exciting day for our relationship with Wembley. "Next year we will celebrate the 90th anniversary of the first Challenge Cup final at Wembley in 1929." This is the first change to the scheduling of the cup final since it was moved from its traditional May berth to the August Bank Holiday weekend in 2005. Wembley's big day has been hit by falling gates in recent seasons - in the wake of rising prices, the growth of the Super League Grand Final and Wembley's rebuilt stadium losing its once iconic lure. There are notably fewer supporters of clubs other than the finalists - once a Wembley cup final tradition in rugby league - turning up on the big day. 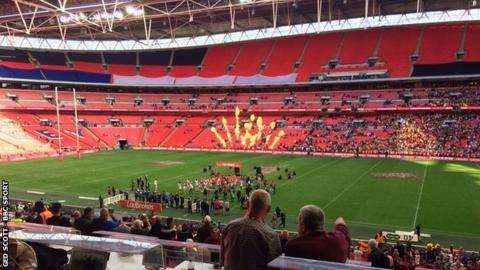 In 2017, the RFL was able to sell tickets for the middle ring of 'Club Wembley' tickets for the first time, which had previously counted on the attendance. But the RFL hope that the planned move to July, and the introduction of a new competition, the 1895 Cup, for Championship and League 1 clubs only, with a final to be played on the same day as the Challenge Cup showpiece, can help reverse that trend. Rimmer added: "Wembley Stadium has been the setting for so many of the greatest matches and memories in the game's history. "Rugby League is proud of the length and strength of that association. We are therefore delighted to confirm the extension of that relationship until 2027." The game's newest creation, the 1895 Cup, will involve just Championship and League One clubs. Full details will not be revealed until next season's Championship and League One fixtures are announced on Sunday 25 November - but, following a meeting last week, the clubs have agreed to introduce the new competition. It means that there will be now be three finals on Saturday 24 August next year as the Steven Mullaney Memorial Match - for the RFL Champion Schools Final at Year 7 level - will remain as a Challenge Cup final curtain-raiser. "We believe the introduction of the 1895 Cup will give that relationship (with Wembley) another boost," added Rimmer. "It's a recognition that the game has changed since the onset of full-time professionalism in the Super League era. "For a good number of the Championship and League One clubs who have won the Challenge Cup in the past, reaching Wembley currently seems a distant dream." The Challenge Cup is one of sport's oldest competitions, first having played in 1896-97, when Batley beat St Helens 10-3 in the final at Headingley. Wembley staged the final for the first time in 1929, when Wigan beat Dewsbury 13-2. Wembley has since staged 76 Challenge Cup finals, a run broken only by the second World War and the demolition of the old Wembley Empire Stadium, which began in 2000. From 2000 to 2006. the final was played three times at Murrayfield, three times at the Millennium Stadium and once at Twickenham before returning to the rebuilt Wembley in 2007. The 2018 final, won by Catalans Dragons (the first non-English side to won the famous old trophy), was watched by Wembley's lowest Challenge Cup final crowd since World War Two. The move to two professional finals on the same day follows the introduction of same-day Challenge Cup semi-finals, which were introduced for the first time in 2018, at the University of Bolton Stadium.